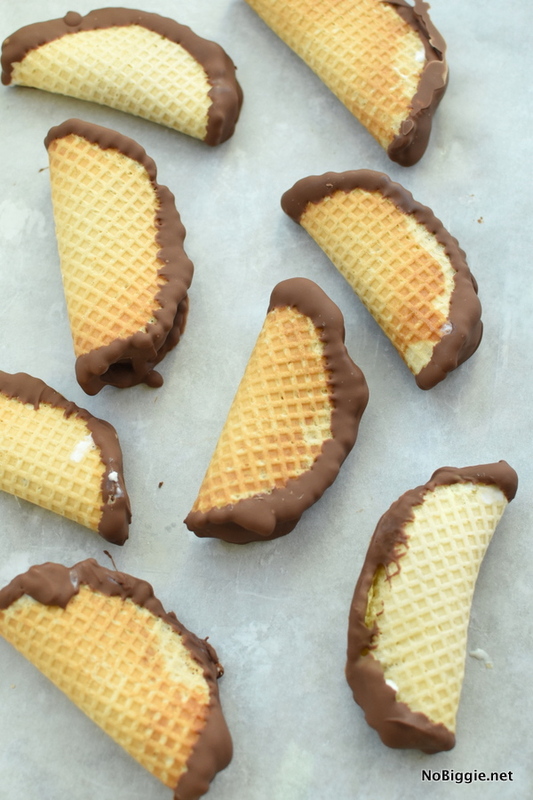 Homemade Mini Choco Tacos is such a fun party dessert. 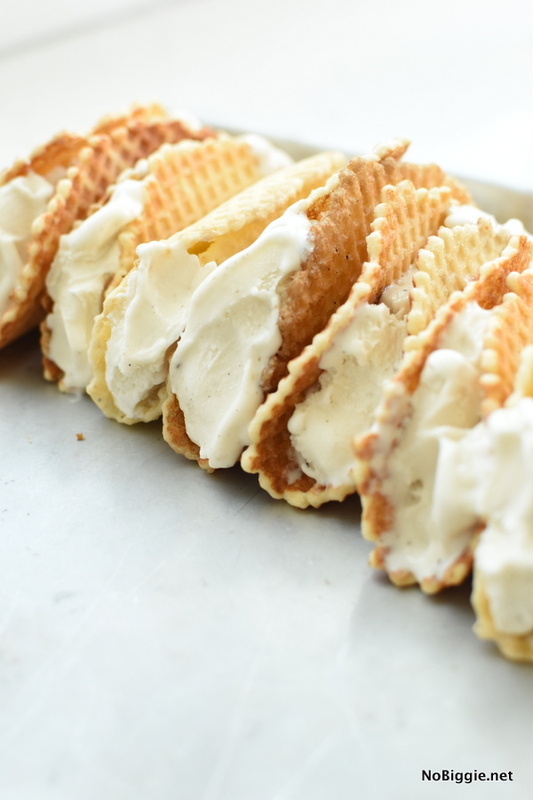 Ice cream is always a hit in the summertime, and this is a fun and different way to serve it up, plus your kitchen will smell amazing with the homemade waffle cone shells. A waffle cone maker has been on my want list for ever, and I finally bought one! I LOVE the amazing scent of homemade waffle cones that fills the air of my favorite ice cream shop, and I’m thrilled to have that scent fill my kitchen now too! These Homemade Mini Choco Tacos are so good! We dipped them in only the best melted Milk Chocolate from Guittard, and then we topped them with a few of our favorite ice cream toppings. 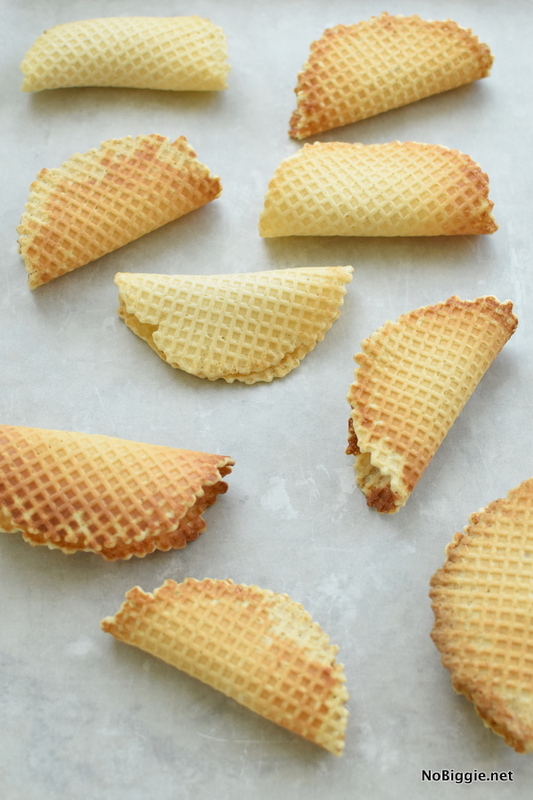 I’ll probably make ice cream cones with the waffle maker too, but making little waffle cone shells was so easy! To make them mini, you only use a tablespoon size of the batter on the waffle maker. My waffle cone maker cooked each one pretty quick, it only took about 40 seconds. Here’s a tip keep your phone timer near by and keep it set to the perfect cook time for your waffle maker. 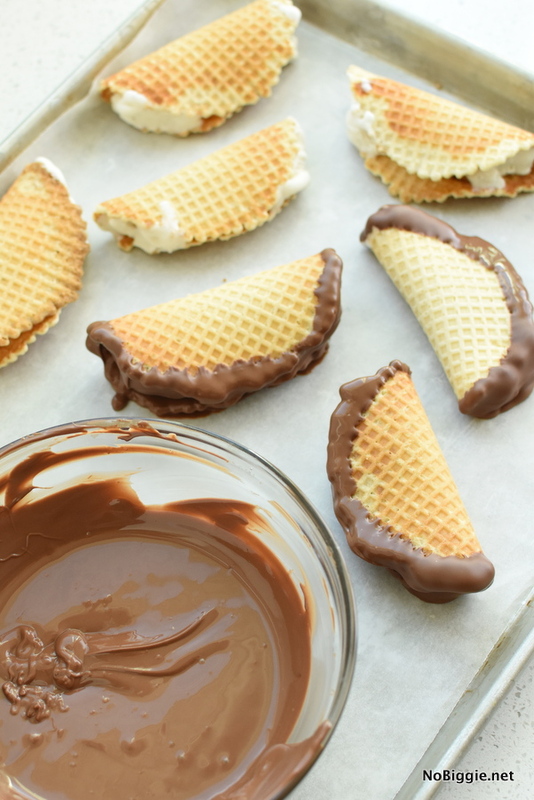 Homemade Mini Choco Tacos make a fun way to serve up ice cream! 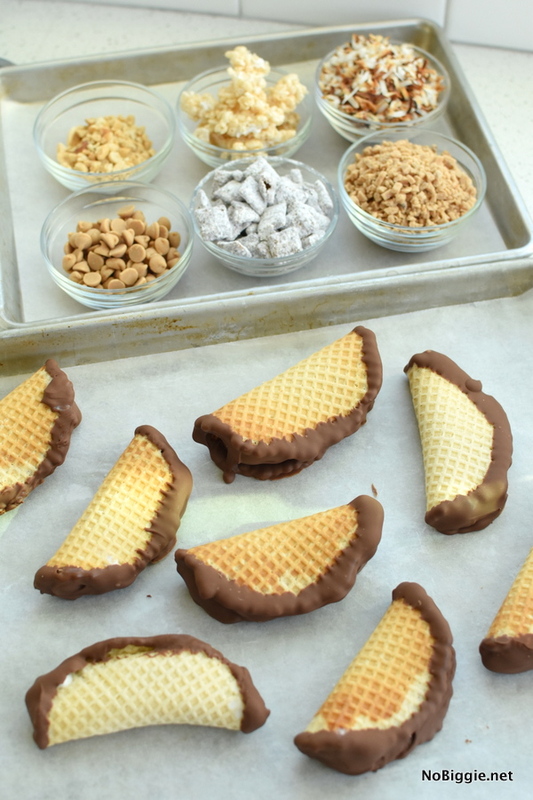 Not to mention the homemade waffle cone shells will make your kitchen smell amazing! Add all batter ingredients to a mixing bowl and whisk until smooth. Allow mixture to sit for 5 minutes. Warm up your waffle cone maker. Add one tablespoon size amount of batter to the center of the waffle maker. Cook times will vary, but each shell cooked for about 40 seconds on our waffle maker or until golden brown. Get the timer on your phone ready to help keep track of time as you cook each one. The first one is usually a flop, but you will get into a rhythm as you cook each one. While each shell is still warm gently wrap the center of the shell around the round handle of a wooden spoon to form a taco shell shape. Gently lift it off and set upside down to cool completely. When they have all cooled to room temp you can fill with ice cream. Once all the shells are filled, place them on a parchment lined tray and keep in the freezer until ready to dip. In a microwave safe bowl warm the milk chocolate chips for 1- 1 1/2 minutes until melted when stirred. Let slightly cool. 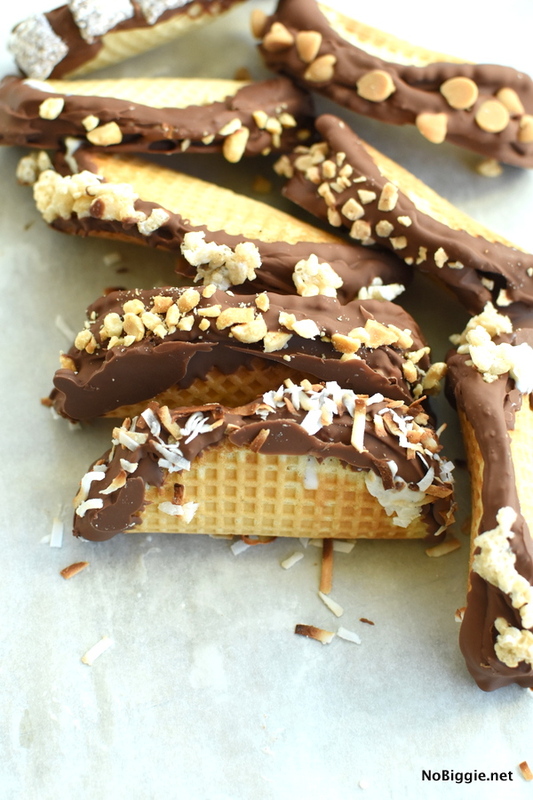 Dip all ice cream tacos into the chocolate and sprinkle with desired toppings. Move back into the freezer to firm up the chocolate for 10 minutes or until ready to serve. Enjoy! Your first taco shell (or cone) will most likely be a flop, and that’s ok, you are just learning how long or short you need to cook it until it’s the perfect golden color you like. Also keep the cooking spray close by, I sprayed the waffle maker a few times in between a making a few. While the shell is still warm, you will gently wrap the center of it around the round handle of a wooden or plastic spoon to form it into the shape of a taco shell. Set it aside to cool while you work on the next one until your batter is all gone. You will want to eat a few just plain, because they are so good, and that’s ok…that’s the fun part of waiting while you work. 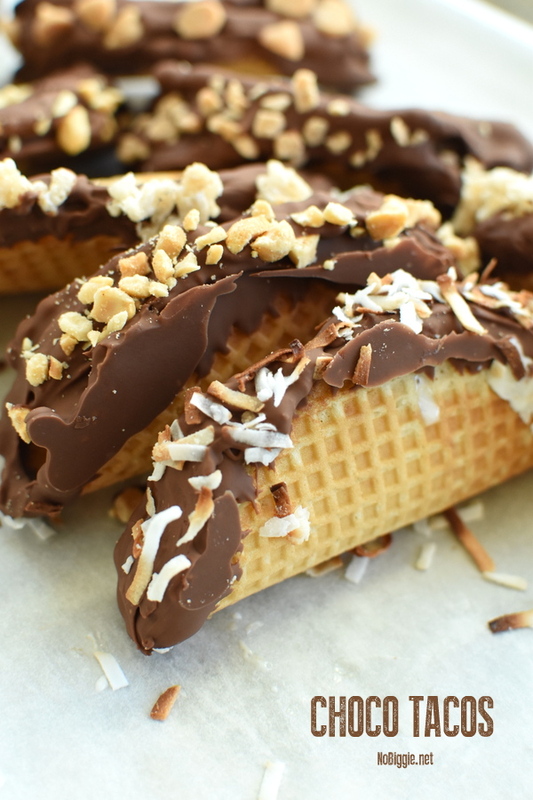 A choco taco bar would be such a fun party idea You could prep the waffle cone shells, fill them with your favorite ice cream and keep in the freezer until ready to serve. 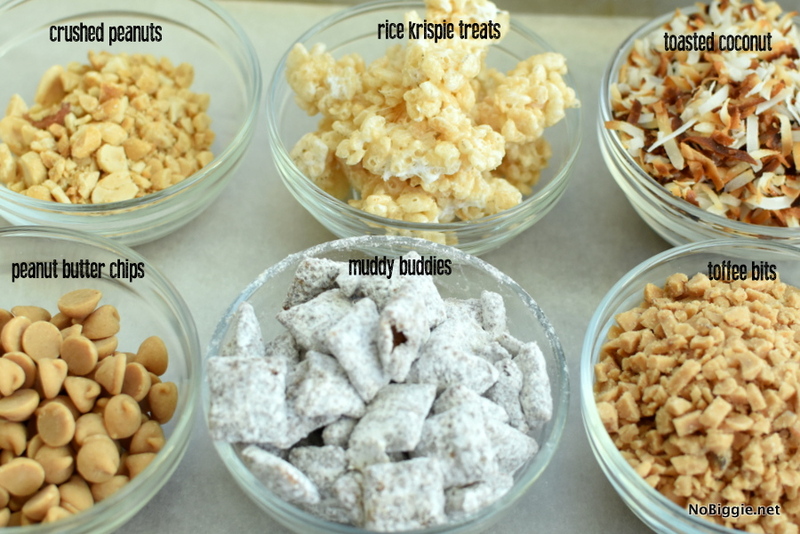 Some of our favorite toppings for the bar include: rice krispie treat clusters, muddy buddies, toasted coconut, crushed peanuts, peanut butter chips and toffee bits. Sprinkles would be fun too! Just add whatever your family loves! They will need a few minutes back in the freezer to set the chocolate, but not long at all! 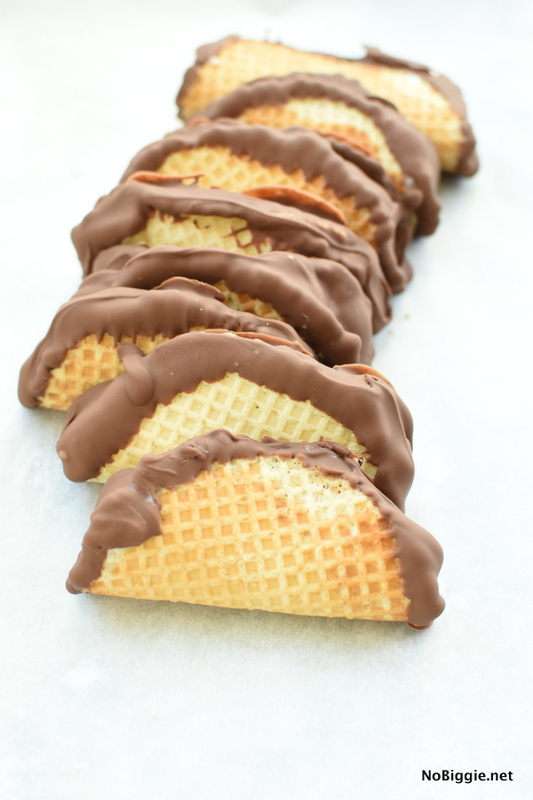 These homemade mini choco tacos were a big hit with my family, and I can’t wait to make them again! You’ve got to make them this Summer!